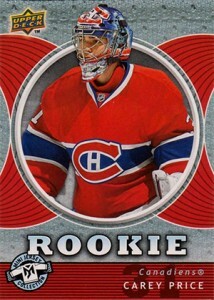 Collectors have been high on Carey Price rookie cards since the goalie started his NHL career. He's one of the current faces of the most storied franchise in hockey history. As the goalie in Montreal, Price has always played in the shadows of other franchise greats like Patrick Roy, Jacques Plante and Ken Dryden. And even though he's one of the top netminders in the league, he'll remain in the shadows until Montreal brings a Stanley Cup back to Quebec and the rest of Canada. The last time that happened, Price was barely in grade school. 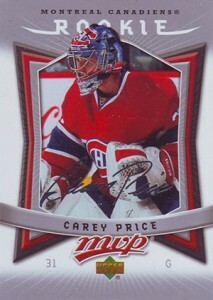 Shop for Carey Price rookie cards on eBay. But should Carey Price raise Lord Stanley's mug in a Habs uniform, he will find himself no longer a man among gods, but rather a hockey god sitting at history's table. 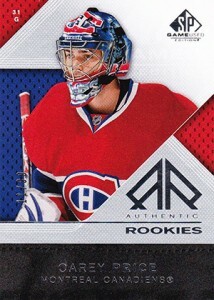 Collectors have nearly 20 Carey Price rookie cards to chase, not to mention countless inserts from his first year. Below is a detailed look at all of his base set rookie cards to help you pick the right ones for your collection. 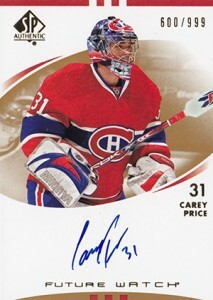 Click on the links or images to shop for singles on eBay and build your Carey Price rookie card collection. What does this card have going for it? Easy. It's rare. 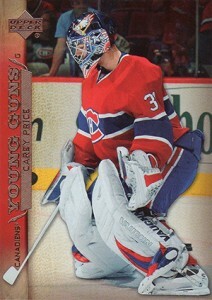 Numbered to 99, it's among a group of the toughest Carey Price rookie cards. But from a design perspective, there's not much to it. 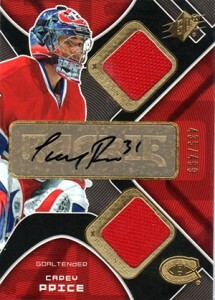 Price also has an autographed insert in the product that might not be as rare, but it's also a fraction of the price. This is one of those cards where all the high-end pieces are there but the price isn't astronomical. That's because of several small things. The print run is low, but there are lots that are lower. It comes with an autograph, but it's a sticker. Other cards are worth more, but if you have an in-between sort of budget, this might be a decent pick. Despite being a short print in a massive set, this card is hardly rare. Printed on retro-style card stock, O-Pee-Chee generally appeals to set builders and those who like to keep things relatively simple. It's a throwback sort of card that has a very reasonable price tag. When the O-Pee-Chee Premier debuted in 1990-91, it was considered high-end. When Upper Deck reintroduced the brand, it had to evolve to keep its premium tag. 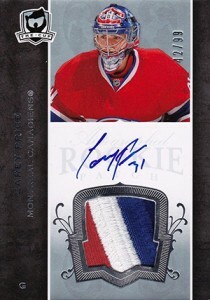 This Carey Price rookie reflects that with four jersey swatches and an autograph. SP Authentic is one of those hobby rarities. It also proves the power of the set builder. The print run of 999 is pretty big compared to many of Price's other first cards. Yet it outsells some that have half the print run. Collectors love SP Authentic and its on-card signatures. So while the print run might be higher, you've also got more people clamoring for it. This card is in a similar place as Be A Player. It's rare and not much else. The print run gives it a premium, but there are many more attractive and cheaper options if you're so inclined. SPx is another long-time brand in the Upper Deck portfolio so there's some familiarity with the name. Not at all subtle, there's a lot going on as far as design goes. The signature is a sticker, but it's done in such a way that it's not as obvious as a lot of other sets. The print run of 499 is a nice balance between being rare and readily available. When Ultra was released, the 2007-08 had not yet begun. 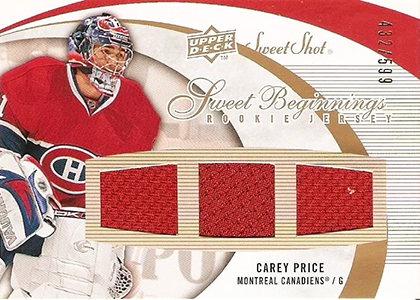 As a result, Carey Price was one of 21 rookie redemptions that were inserted one per box. So while Ultra might not be the premium brand it once was, this isn't the easiest card to come by. Also, because it can't be found in dusted off boxes, the secondary market is the only way to go now. The strength of this card comes from brand popularity. Over the years, no basic rookie cards in the hobby have caught on quite like Young Guns. 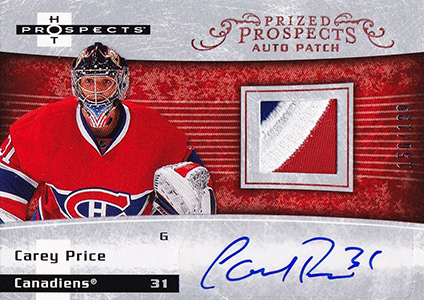 With so many collectors clamoring to build sets and stockpile specific rookies, there's a lot of demand for Price's card. Even without a serial number, signature or swatch, it costs more than the average rookie and is probably the most traded. This is something of an overlooked card. It's by no means high-end. But with 599 copies, it's not the most common card either. If you're on a tighter budget and can't afford to go higher, this is an attractive yet relatively inexpensive choice. 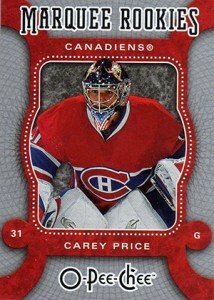 A Quad Diamond short print, this Carey Price rookie card is highlighted by its trademark foil design. In person, the cards look much better and standout immensely. Black Diamond is one of those sets that has broad appeal so while it's not the toughest card to find, it does command a significant premium over many of Price's other rookies. 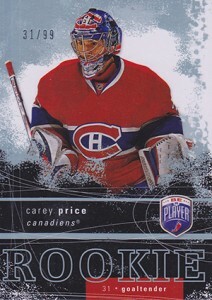 Falling under the same category as Be A Player and SP Game Used, the big selling point of the 2007-08 Upper Deck Ice Carey Price rookie is the print run. With just 99 copies, it's rare. However, unlike Be A Player and SP Game Used, which are both rather plain otherwise, Ice uses acetate stock to make it stand out. The Ice Premieres name is also better known. 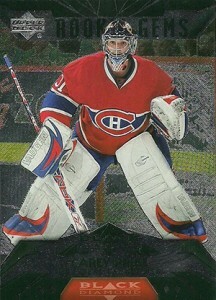 If there was an award for Forgotten Carey Price Rookie Card, this would be it. As a brand, Mini Jersey didn't last long. For an individual card, there's not much to this. It's plain. The design is okay in some ways, tacky in others. But it's tough to beat the price (no pun intended). 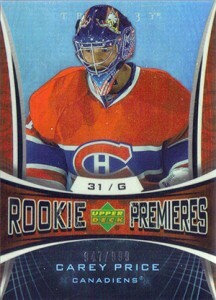 Although this is a low-end Carey Price rookie, you won't find it in packs anymore -- at least regular packs. Every box of 2007-08 MVP came with a redemption for a special three-card Rookie pack. Price was included in this part of the set. Despite its non-traditional distribution, it's still affordable. 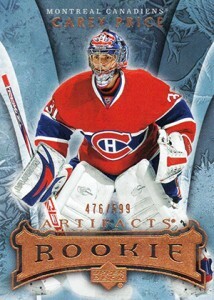 If you're looking for a cheap Carey Price rookie that looks cool, Ovation would be a solid choice. It's not particularly limited and the brand is now defunct. But there's something about the graphics that work and sometimes that's the most important thing about a great card. The Sweet Beginnings card focuses heavily on memorabilia with three swatch windows. It's somewhat rare, but not overly. A more intriguing choice might be the Signature Saves Puck Signing insert from the product. It has an autograph that's done on a puck-like material. It's the hockey equivalent of the Sweet Spot Signatures used in baseball. 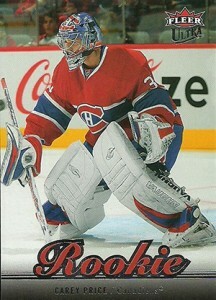 If you want the best Carey Price rookie card, this is it. Brand pedigree is the first part. An on-card autograph, generous patch swatch and miniscule print run seal the deal. If you're looking to land one of these, be sure to save as they're not cheap. The foil design gives it a bit of a premium look and feel but its print run keeps prices in check. It's not a bad option, but it is a card that is often lost in the shuffle. Straddling rarity and autograph status, this could be a bargain for those who have a slightly bigger budget. 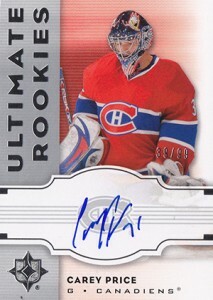 It's one of only four Carey Price rookies to have an on-card autograph and it's limited to 99 copies. Yet it goes for a small fraction of what The Cup sells for. So if signatures are your thing and you don't care for memorabilia as much, this is definitely the route to go. 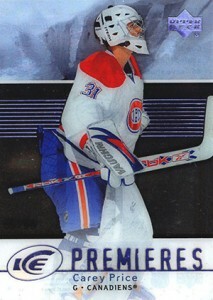 GMA 10 Gem Mint CAREY PRICE 2007 08 Upper Deck ROOKIE CARD MONTREAL CANADIENS! 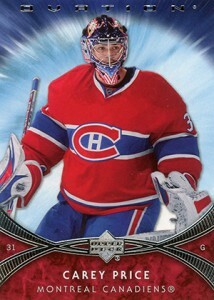 GMA 10 Gem Mint CAREY PRICE 2007 08 UD Upper Deck VICTORY HABS ROOKIE CARD ! What, no love for his UD Victory #303? It still counts, doesn’t it? pawgsha � It could be there, though it can also be seen as an UD Series 2 insert. You know book value ?